The sting rays do not have dorsal fins and their tail is very long and filamentous, toothed and especially toxic and they use it only has a defence system. 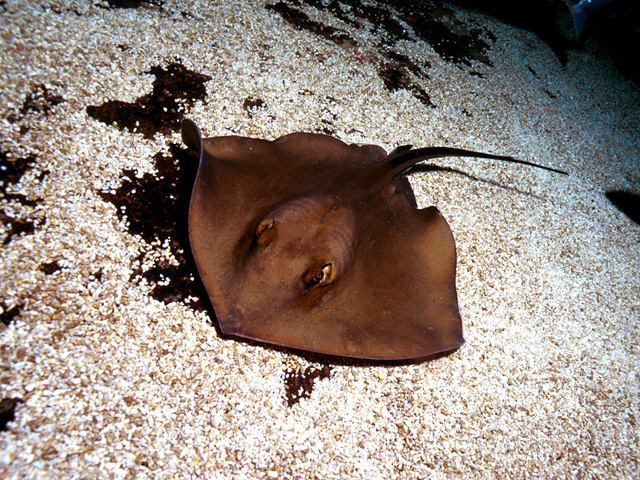 The common sting ray is greenish yellow on the back and lighter on the belly. Its maximum size is 3 m. Its average weight is 14 kg, but it can weigh up to 32 kg. It is a carnivorous animal that feeds on fish and invertebrates such as crustaneans and molluscs. Its reproduction is oviparous and the embryos feed on the uterine secretions of the mother. Its gestation lasts for 4 months. It produces a small number of offspring, between 4 and 7. It lives on the coast up to depths of 200 m, but usually lies above 60 m. It is normally buried in sandy beds. It can live in salty waters (intermediate salinity). The common sting ray is found in the Mediterranean, the Black Sea, the Eastern Atlantic (from Madeira to Norway) and in the English Channel. Species not evaluated (according to the red list of endangered species). The common sting ray is an animal that has given rise to different beliefs and legends. 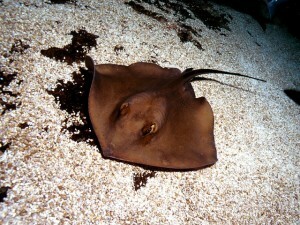 One legend explains that Kirke gave his son a lance with a sting ray’s spine at the end, which he used to kill Ulyses. The ancient Greeks believed that the point of the sting ray could cause plants and trees to wither and die if it was rubbed against the bark. According to another belief, if the spine was removed from a living sting ray and immediately attached to the belly of a pregnant woman, it made the birth easier. Have you ever seen a sting rays in the market? The sting ray has a poisonous needle at the end of its tail, capable of causing serious injuries, which is why most individuals appear with their tails cut in the markets.